Along with over 90 different kinds of chocolate candies, fresh roasted nuts, 4 different kinds of Fudges,12 different kinds of Hard Candy, Peanut Brittle and Fresh Carmel Corn plain or with peanuts or pecans, Sherni's Candies also carry a special treat - Chocolate Covered Potato Chips. Everyone loves Potato Chips but what about covered in a thin layer of milk chocolate? 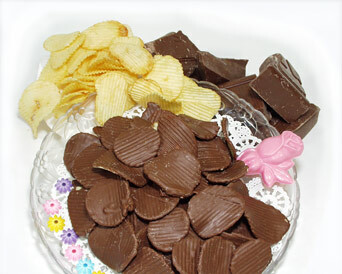 Chocolate Covered Potato Chips is one candy you can’t get enough of. We sell them in 3 different sizes bags or box them to ship. We sell ¼ lb., ½lb. and 1lb. Sherni's Candies goes thru about 7-9 cases of chips a week. The salty and sweet together make a great combination. Everyone says “ Oh I don’t think I would like that” but when tasted they can’t get their fill of them with the salty sweet taste. Try Some Today! 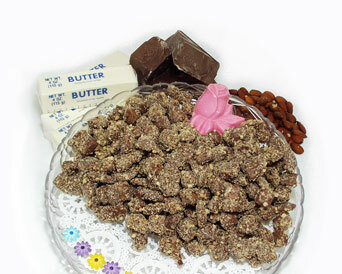 Butter Krunch is another customer favorite.